Fabric Structure | Engineering & Design | Lightweight Manufacturing Inc.
Lightweight Design has structural engineers and design professionals on staff and can assist with specialized structural engineering and design services for tensioned fabric structures. Lightweight Design is the engineering division that can work closely with Lightweight Manufacturing for projects where both engineering and manufacturing services are required for tensioned fabric projects. 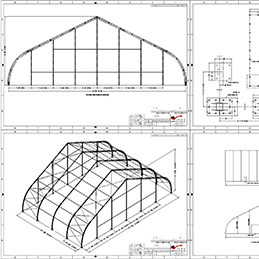 With the engineering services, we offer certification for new and existing fabric structures, along with engineering drawings and sealed calculations to local building code standards. We provide designs of new rental tents and fabric structures, as well as modification of existing designs. Many tensioned fabric structures are designed as standardized, modular systems. Both for rental projects and permanent structures, there is a need to certify a standard structure for use in a particular project with its own load requirement. This can be done with drawings or with a combination of calculations and drawings, depending on the regulatory requirements. Certifications for submittal are sealed by a Professional Engineer (PE) certified in the jurisdiction where the project is located. We provide engineering reviews and certifications for all different types of tensioned fabric structures and rental tents with a PE seal in any US State. This includes reviews of clearspan tents, tensile tents, and frame tents. An engineering package will normally include drawings defining the structure, load assumptions and reactions on the anchoring. It also includes sufficient detail for the calculations so that another structural engineer, or a building inspector, can recreate (portions of) the calculations to verify their validity. 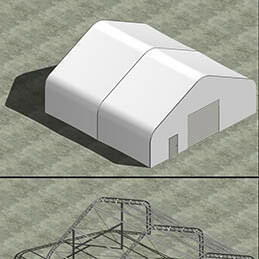 Lightweight Design provides complete engineering for permanent fabric structures. This includes tensile structures and frame supported structures. Please note that Lightweight Manufacturing/Lightweight Design is committed to respecting your privacy and protecting your personal information and will always treat it with the utmost care and will never share your information with any third party.